With the design world moving at an ever-increasing pace, it’s near impossible to buy into any trend which will last longer than a season. That’s what makes a view into Katharine Pooley’s newest project – a central London location commissioned by an “esteemed returning client” – such a treat. Described as a showcase of “modern luxe”, the home is a well-executed blend of classic cool scattered with a cocktail of this year’s most plush and lasting trends. The look is tailored yet comfortable, rich yet liveable. And whilst a masculine vibe might take precedence, the space is far from being unapproachable thanks to its luxurious layers and unique finishes of calcatta bluette marble and agate, plush velvet upholstery and inviting furniture arrangements. 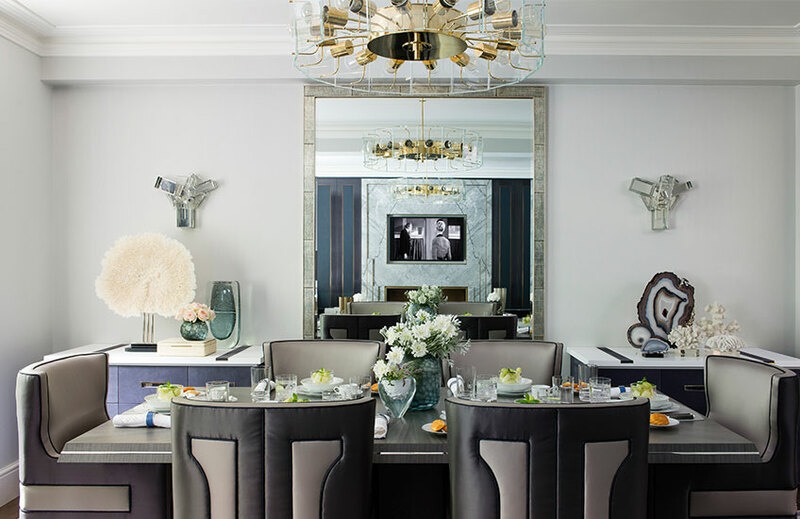 Combined, they speak of modern luxury exactly as planned and, equally impressive, the project achieves the ultimate interior designer goal – it is undoubtedly classic Katharine Pooley but by no means monotonous or predictable. The joint living and dining room is a key influencer for the home, boldly setting the tone which permeates the other spaces, albeit on a subtler level. 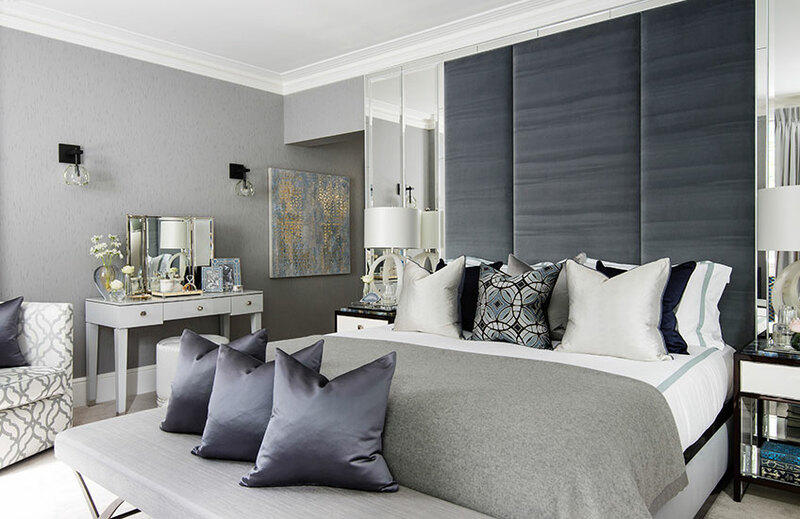 “The client requested a timeless space that would capture the glamour of London, whilst also being a home of comfort, tranquility and calm,” says Katharine. And glamour, comfort, tranquility and calm, it delivers in almost equal doses. Taking the accent wall to a whole new (and much more stylish) level, a floor to ceiling calcatta bluette marble fireplace inlaid into bronze fittings steals the limelight becoming a grand modern focal feature. The marble’s natural veining is perfectly placed thanks to clever book matching creating a unique juxtaposition between it and the smart lines of the bronze inlay. All is flanked with deep indigo lacquered timber and navy blue leather panelling which bring depth to the bright room. On the sofa, cushions add a retro feel as the room’s brass accents are complemented with pewter-toned fabrics and embroidered graphics. The lace-like patterned curtains offer the aesthetic of travertine in keeping with the home’s unique natural stone finishes. 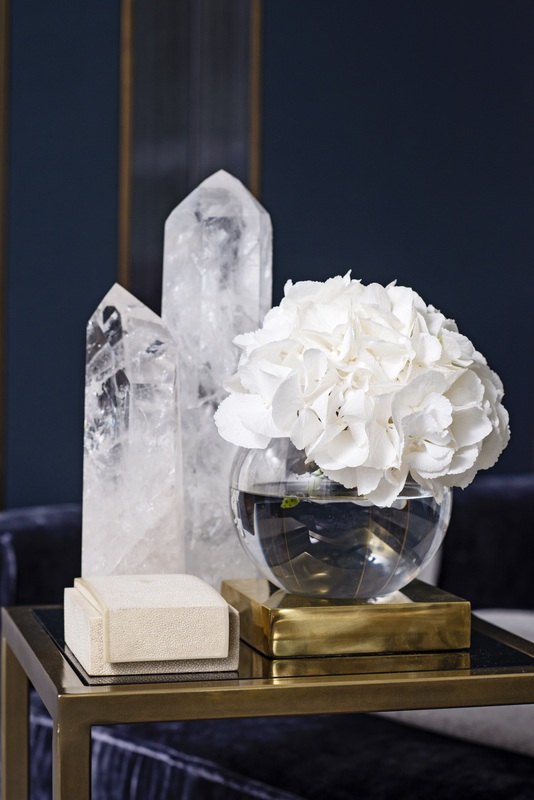 By way of accessories, bang-on-trend agate slices and mineral obelisks adorn the tabletops whilst a coral sculpture, organic bowl and dappled Guaxs vase are illuminated by light streaming in through the window adding delicacy to the scheme. Topping off the space and bringing attention to its satisfyingly simple white polished plaster architectural details, hangs a singular show-stopping chandelier – a multi-sided radial design crafted of glossy brass with exposed bulbs and rimmed with clear Perspex panels. The dining area (which is only separated from the living room by a small gap between two carved silk rugs) maintains a similar vein with a matching chandelier and curtains as well as the beautiful pale grey silk wallpaper which lines the room throughout. 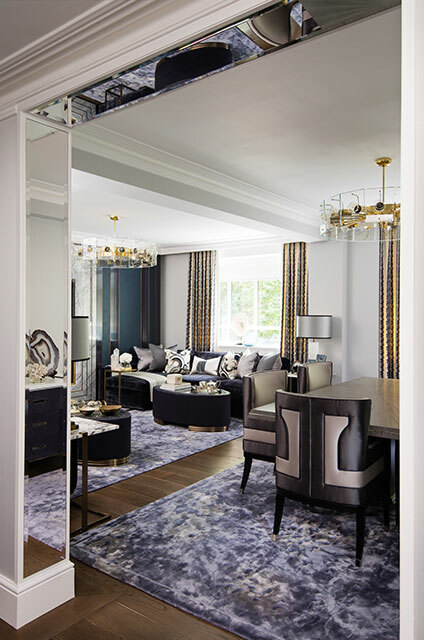 Panelled and piped silk dining chairs accompany a starburst-effect table (elegantly tapered at its edges) and rock crystal wall sconces hang at either side of a crackle glass mirror above two leather-clad chest of drawers. 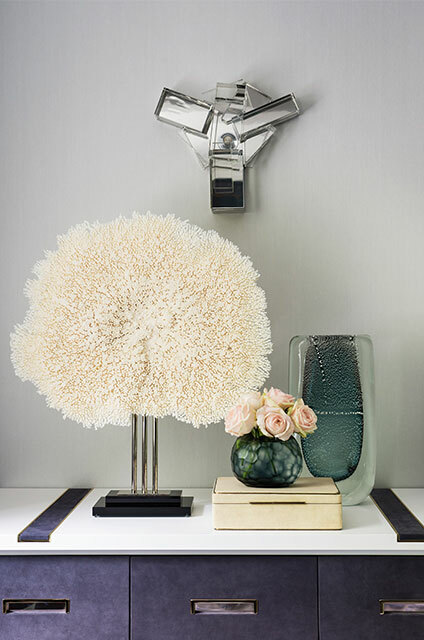 Refreshing coral sculptures contribute to the project’s underlying nod to nature. In the bedroom, a calming blue palette is softened with delicate feminine touches. The master bedroom masters stylish unisex design with a relaxing colour palette of dove grey, charcoal and navy blue tones. An oversized part upholstered, part mirrored headboard spans the height of the room – the perfect stage for a bed/bedside table complement which is dressed up with rows and rows of decorated cushions. Enhanced by the mirrored panels, the bedside tables are topped with a stunning tablet of Indian agate, commissioned by the designer, and accessorised with spherical alabaster table lamps. A pretty dressing table with a triptych mirror is found laden with delicate glass cosmetic pieces from Katharine’s collection – proof that masculine and feminine styles can indeed coexist. As always, it’s Katharine’s understanding of the timelessness of flawless finishes, effective yet subtle colour schemes and never being too afraid to include something a little surprising that, for this home, makes classic styling so easy. And cool to boot.